Nudobius luridipennis Casey (fig. 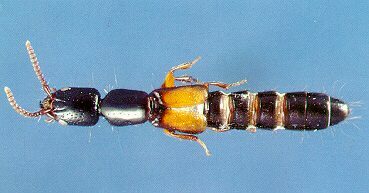 13): N. luridipennis (7.5-8.2 mm), like other staphylinids, are slender and elongate with very short elytra (usually only as long as the elytra are wide). The antennae are beadlike and medium length. It should be noted that there are other species of staphylinids associated with the SPB that, although quite common, are yet undescribed.